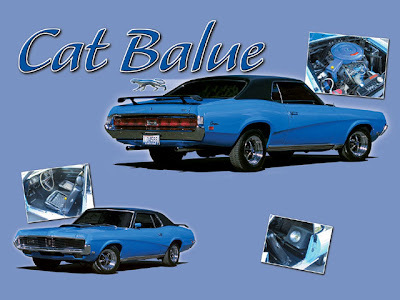 The blue '69 Mercury Cougar shown here belongs to Jason Bushman-a 19-year-old, dyed-in-the-wool Blue Oval fan from Edmonds, Washington. The good-looking cat has been lovingly restored by Jason and his father, with a little help from the folks at the Northwest Pony Shop. Jason tells us he was born into a Ford family and that he drives this car every day to school and to work. 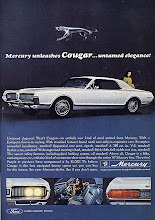 He and his dad certainly had their work cut out for them, as the '69 Cougar didn't always look this good. The Bushmans discovered this car sitting forlornly at a construction site, the victim of a recent theft and recovery. All the glass had been smashed out and the upholstery was ripped to shreds, but they were not discouraged. 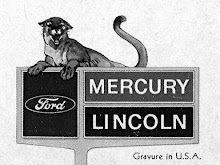 For one thing, the Cougar still has its original 351 Windsor engine. Five hundred dollars did the trick for the pink slip, and then the massive amount of refurbishment work began. The Cougar was originally equipped with the deluxe interior package, so new deluxe upholstery and carpeting bring things up to spec. The interior's original instrument cluster is in good condition and the OE Rim-Blow steering wheel is still present. The car was also equipped with the rare rear-window defogger option, while the sound department has been upgraded with an Alpine amplifier, a Sony CD player, and Pioneer speakers and sub. When Jason and his family discovered the car, it had only 83,000 original miles. As the 351W engine ran just fine, they decided to leave well enough alone-for now. They carefully cleaned and detailed everything in the engine compartment. The engine looks good, sporting a set of Cobra rocker covers and a stock air-cleaner assembly. The only performance upgrades so far include an Edelbrock Performer 351 intake manifold and a 650-cfm, four-barrel carb. The mild-mannered Windsor mill is connected to the original FMX three-speed automatic transmission, and power then goes back to a nine-inch axle with 3.00:1 gears. An Optima battery adds peace of mind. The whole package now runs low 15s. All this hard work resulted in a First-Place finish at the Mustang Roundup teen class. The blue cat was also recently displayed at the Seattle Roadster show. We think it's safe to say that Jason does indeed come from a Ford family, as other notable Blue Oval cars in the Bushman stable have included a '69 Cougar Eliminator and a '67 Mustang 2+2. We think Jason sure is a lucky guy to have this great car, as well as such super support from his family.